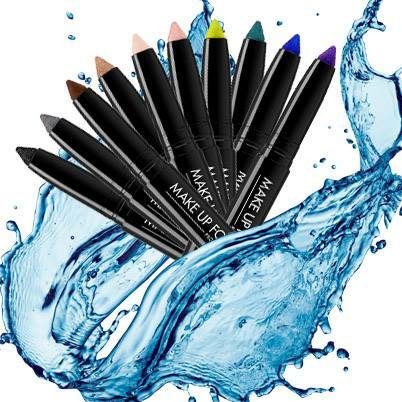 Make Up For Ever Aqua Matic - $25 - in 10 shades: Diamond Black D-10, Satiny Warm Brown S-60, Diamond Golden Grey D-12, Iridescent Pop Purple I-90, Iridescent Electric Blue I-22, Iridescent Turquoise I-20, Iridescent Lime Green I-30, Metallic Golden Taupe - ME-50, Metallic Pinky Beige - ME-54, Satiny Flesh-Colored Pink - ME-52 - with a creamy, highly-pigmented, waterproof, smudge-free, creaseless formula that provides nonstop colour that glides on and stays put. You'll love the blendable texture that includes silica, oils and polymers to create a flexible film, so it applies effortlessly onto the eyelid, feels weightless and won’t transfer. The pencil format makes them easy to use, swipe one shade across your lid for a quick and easy look or create a multicoloured effect by layering on additional shades and blending them together. The pinky-beige and flesh-colored pink shades also make great primers to keep your powder shadow from budging! Available now at Sephora and sephora.ca across Canada and at Make Up For Ever boutiques in July.